MozPali Font. A simple homemade font with the diacritical marks for Pali transliteration. Needed for viewing Pali text sections of some versions of this website. Keyboard layout for MozPali - also on this page a keyboard layout for the SP Ionic Greek font. See: AmericanPictogram for the keyboard layout for this font. 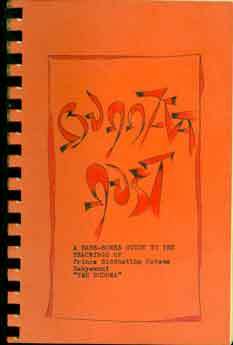 The Michael Olds translation of the Mulapariyaya Suttanta of the Majjhima Nikaya. This is formatted as a Word Document with the American Pictogram Font, suitable for printing out. The American Pictogram Font is included in the File. Warren's Textbook introducing Buddhism by way of translations from the Pali. A wide selection of sources organized by way of the Tripple Gem: Buddha, Dhamma, Sangha. Some oddities in the translation, and some choices one could live without, but all-in-all a great book for beginners. The Pali English Dictionary, Rhys Davids and Stead. Zipped file. The Bhikkhu Nanamoli 3-volume manuscript used as the basis for the Bhk. Bodhi edited edition. David N. Snyder, Ph.D.: The Complete Book of Buddha's Lists - Explained. L.S. Cousins, Journal of Buddhist Ethics, Vol. 4., Sep. 1, 1997. Review of Bhk. Bodhi's edited edition of Nanamoli's translation of the Majjhima Nikaya, Middle Length Discourse of the Buddha.